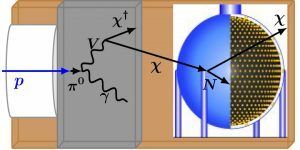 The MINOS+ collaboration at the Department of Energy’s Fermilab has published a paper in Physical Review Letters about their latest results: new constraints on the existence of sterile neutrinos. The collaboration has exploited new high-statistics data and a new analysis regime to set more stringent boundaries on the possibility of sterile neutrinos mixing with muon neutrinos. They have significantly improved on their previous results published in 2016. With close to 40 publications that have garnered more than 6,000 citations, MINOS has been at the forefront of studying neutrino oscillations physics since its first data-taking days in 2005. The experiment uses two iron-scintillator sampling-and-tracking calorimetric particle detectors: The near detector is placed 1.04 kilometers from the neutrino source at Fermilab, and the far detector is placed 735 kilometers away in Minnesota. 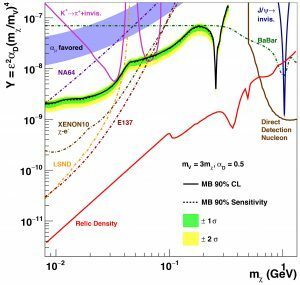 The MINOS experiment collected data using a low-energy neutrino beam from May 1, 2005, to April 29, 2012, and MINOS+ collected data with a medium-energy neutrino beam from Sept. 4, 2013 to June 29, 2016. The detectors have accumulated high-statistics samples of muon neutrino interactions. Using a Fermilab neutrino beam composed of almost 100 percent muon neutrinos, they measured the disappearance of muon neutrinos as the particles arrived at the far detector. The collaboration used these data to obtain some of the most precise to-date measurements of standard three-neutrino mixings. These data also restrict phenomena beyond the Standard Model, including the hypothetical light sterile neutrinos. The analysis has simultaneously employed the energy spectra of charged-current (W boson exchange) and neutral-current (Z boson exchange) interactions between the neutrinos and the atoms inside the detector. Using a neutrino oscillation model that assumed the existence of the three known kinds of neutrinos plus a fourth type of neutrino referred to as a single sterile neutrino, the MINOS+ collaboration found no evidence of sterile neutrinos. Instead, the collaboration was able to set rigorous limits on the mixing parameter sin2θ24 for the mass splitting Δm241 > 10−4 eV2. 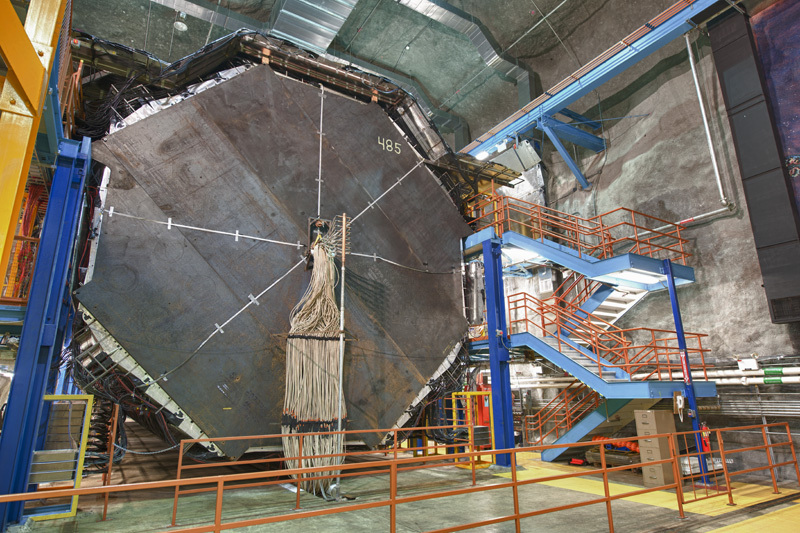 The results significantly increase the tension with results obtained by experiments conducted with single detectors studying electron neutrino appearance in a muon neutrino beam. The LSND and MiniBooNE techniques and limited statistics present challenges that are now being tackled by the MicroBooNE experiment at Fermilab, designed specifically for this task. Scientists from 33 institutions in five countries — the United States, UK, Brazil, Poland and Greece — are members of the MINOS+ collaboration. More information can be found on the MINOS+ website. This work is supported by the U.S. Department of Energy Office of Science. International collaborators are delivering parts to be used in Fermilab’s Short-Baseline Neutrino program. 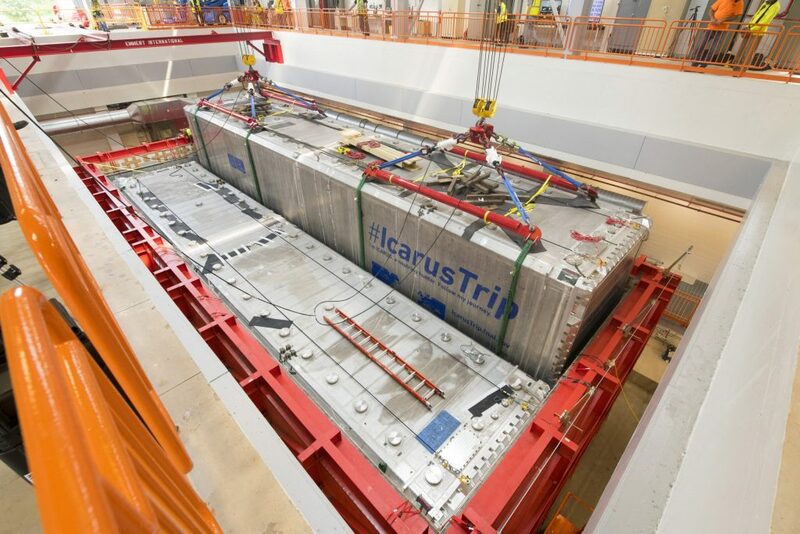 Major components for a new neutrino experiment at the US Department of Energy’s Fermi National Accelerator Laboratory are arriving at the lab from around the world. The components will be used in the upcoming Short-Baseline Near Detector, an important piece of the laboratory’s neutrino program. The first of four anode plane assemblies, highly sensitive electronic components, came to Fermilab in October. More are on their way. SBND is one of three particle detectors that make up the Short-Baseline Neutrino program at Fermilab. Neutrinos, renegade particles that are famously difficult to study, could provide scientists with clues about the evolution of the universe. The Short-Baseline Neutrino program, or SBN, focuses its search on a particular type of neutrino, called the sterile neutrino, which could be the explanation for unexpected results seen in several past neutrino experiments. The particle’s existence has been teased but never clearly confirmed. SBND will also be a testing ground for some of the technologies, including the anode plane assemblies, that will be used in the international Deep Underground Neutrino Experiment, known as DUNE, a megascience experiment hosted by Fermilab that is currently under construction in South Dakota. Fermilab’s three Short-Baseline Neutrino detectors will be positioned at various distances along the path of a neutrino beam generated by Fermilab’s particle accelerators. “The reason you have three detectors is that you want to sample the neutrino beam along the beamline at different distances,” says Ornella Palamara, SBND co-spokesperson and neutrino scientist at Fermilab. Of the three, SBND will be the nearest to the beam source at a distance of 110 meters. The other two, MicroBooNE and ICARUS, are 470 meters and 600 meters from the source, respectively. MicroBooNE has been taking data since 2015. ICARUS, installed earlier this year, is expected to begin taking data in 2019. As neutrinos pass through one detector after the other, some of them leave behind traces in the detectors. SBN scientists will analyze this information to search for firm evidence of the hypothesized but never seen member of the neutrino family. Neutrinos come in one of three lepton flavors, or types, which correspond to three other particles: electron, muon and tau. They change from one flavor into another as they travel through space, a behavior called oscillation. Neutrinos are known to oscillate in and out of the three flavors, but only further evidence will help scientists determine whether they also oscillate into a fourth type—a sterile neutrino. SBN scientists will look for signs of neutrinos oscillating into the new type. “The overall goal of the SBN program is to perform a definitive measurement that tests the possibility of sterile neutrino oscillations,” Palamara says. Sterile neutrinos are hypothetical particles that don’t interact with matter at all. (The neutrinos we’re familiar with do interact, but only rarely.) In 1995, results from the LSND experiment at Los Alamos National Laboratory hinted at the possibility of the sterile neutrino’s existence, but so far, no one has confirmed it. Results from the MiniBooNE experiment at Fermilab also indicate that something is going on with neutrinos that we don’t yet fully understand. SBND, as the first detector in the beam, will record the number of electron and muon neutrinos that pass through it before oscillation can occur. The vast majority of them—about 99.5 percent—will be muon neutrinos. By the time of their arrival at the far detectors, MicroBooNE and ICARUS, a few out of every thousand muon neutrinos may have converted into electron neutrinos. “The SBN program is powerful because you can measure this oscillation by looking at two different effects,” Palamara says. One is that the far detectors see more electron neutrinos than expected. This could be evidence that sterile neutrinos are also present: The neutrinos could be converting into and out of sterile neutrino states in a way that produces an excess of electron neutrinos. The other is that the far detectors see fewer muon neutrinos than expected—the muon neutrinos spotted in SBND “disappear”—because they converted into sterile neutrinos. Either effect could indicate the existence of the new particle. SBND will be a 4-by-4-by-5-meter tank—the size of a large bedroom—filled with liquid argon. Its active liquid-argon mass—the volume monitored by the anode plane assemblies, or APAs—comes to 112 tons. The APAs, situated inside the detector, are huge frames covered with thousands of delicate sense wires. An electric field lies between the wire planes and a cathode plane. When a neutrino collides with the nucleus of an argon atom, charged particles are produced. These particles stream through the liquid volume, ionizing argon atoms as they pass by. The ionization produces thousands of free electrons, which “drift” under the influence of the electric field toward the APAs, where they are detected. By collecting these clouds of electrons on the wires, scientists create detailed images of the tracks of the particles emerging from a collision, which give information about the original neutrino that triggered the interaction. The construction of the wire planes is a collaboration between a group of universities in the United Kingdom funded by the Science and Technology Facilities Council, part of UK Research and Innovation, and another group of universities in the United States funded by a grant from the National Science Foundation. The US effort to build the wire planes was a collaboration between Syracuse University, the University of Chicago and Yale University. In the United Kingdom, Lancaster University, Manchester University and the University of Sheffield contributed to the effort. The APA technology will also be an integral part of DUNE, which will be the world’s largest liquid-argon neutrino detector when complete. The National Science Foundation recently funded a planning grant for DUNE’s anode plane assemblies; the NSF has a long history of pioneering investments in major particle physics experiments, including several neutrino experiments. Institutions in Europe, South America and the United States are helping build SBND’s various components. In all, more than 20 institutions on three continents are involved in the effort. Another dozen are collaborating on software tools to analyze data once the detector is operational, Schmitz says. 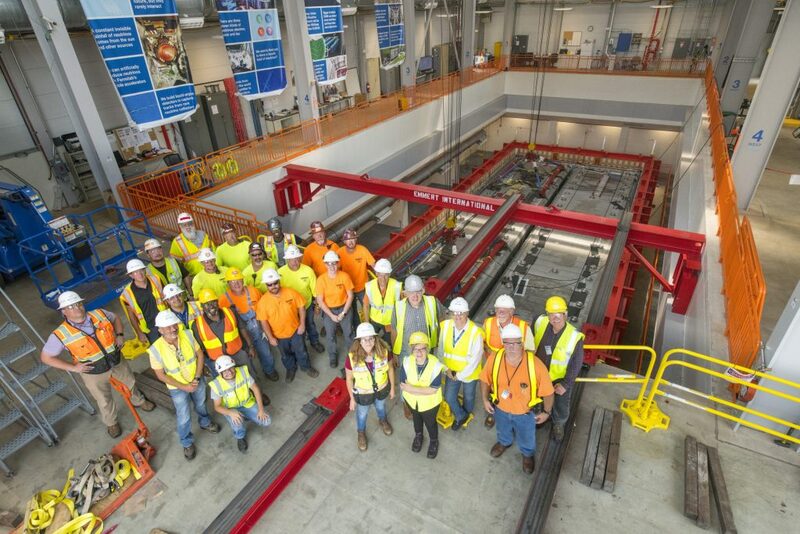 Assembly of SBND is expected to finish in fall 2019, after which the detector will be installed in its building along the accelerator-generated neutrino beam. SBND is scheduled to be commissioned and begin receiving beam in June 2020.